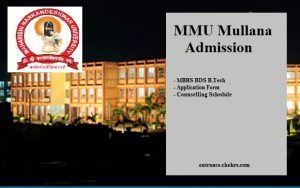 MMU Mullana Admission 2017- महर्षि मार्कंदेश्वर विश्वविद्यालय प्रवेश: Maharishi Markandeshwar University (MMU), Mullana, Ambala has releaesd the notification for MMU Mullana Admission for its various courses such as MBBS, BDS, B.Tech etc. All the intrested candidates who want to pursue their studies in MMU university can now apply online by filling MMU Mullana Application Form 2017. Applicants must meet certain eligibility criteria before applying for its various courses. Therefore aspirants who fulfills the eligibility will be further called for MMU Mullana Counselling 2017 process and provided their seats. For further details of MMU Mullana BDS admission procedure, go through the article below. Maharishi Markandeshwar University (MMU), Mullana, Ambala is one of the prestigious University of our country. Every year thousand of aspirants apply for taking admission into its various courses. The admission into its B.Tech, BDS, MBA etc courses are based on merit. Therefore aspirants who are currently seeking for MMU Admission 2017, can now apply by filling its online form. Through our portal candidates can also get details of MMU Mullana B.Tech Admission along with the admission process of other courses. Candidate must have passed 10+12 with Physics, Maths and either one subject Chemistry, Biology or Computer Science and English with 60% aggregate and 40% (SC/ ST). However, for admission to B. Tech (Biotechnology), the candidates with Physics, Chemistry and Biology/Biotechnology is also be eligible. Candidate must have passed 10+12 with Physics, Maths and Biology from a recognized board. For more details on MMU Mullana Admission 2017, keep visiting our portal and get the latest alert. For any kind of further query place your comments below.